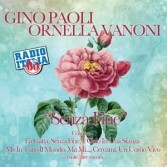 14 Ornella Vanoni - Ma Mi.. Songs that belong to our history, performed by two magnificent Italian interpreters: Ornella Vanoni, a velvety and extraordinarily expressive voice, gives warmth and life to the classics of music. Gino Paoli, a great composer, author and performer, performs the pieces with the skill and mastery of those who can write music in an extraordinarily unique way.